This newly renovated dog run, which reopened in the fall 2015, has become very popular, very quickly. It’s easy to see why. The new dog run is attractive and has lots of nice features. It is divided into small dog and large dog areas, each area has drinking fountains and free waste bags, and the ground cover is K9 Grass, an artificial grass made specifically for dog runs. There are young trees planted for shade and benches for people to sit on. The dog run is surrounded by 6-ft high estate fencing. One drawback is that the trash can is located outside the dog run, which requires dog owners to exit the run to throw away waste bags. Check out the Bay Park Dog Run Facebook Group to see what’s going on at the park and get good articles about dog park etiquette, dog behavior, and other relevant topics in the Files section. —Thanks to Mark Keating and Rich Damm for contributing to this article. 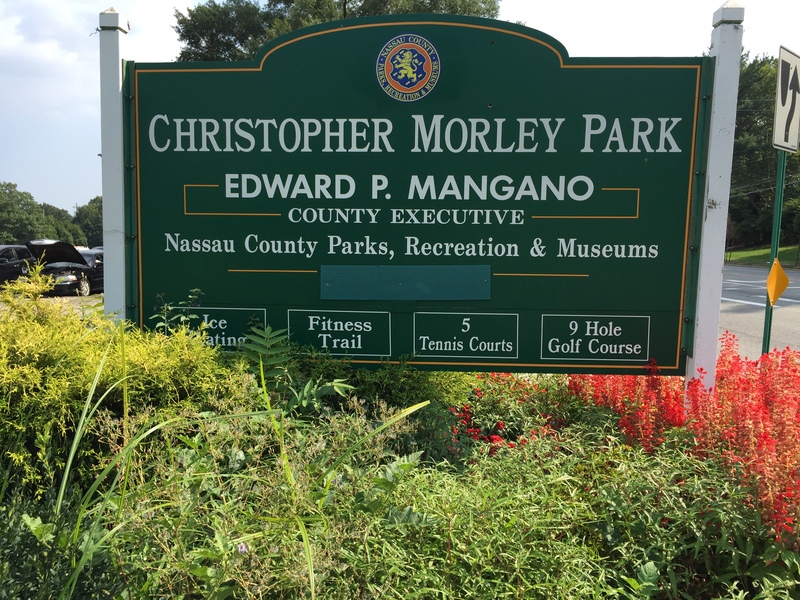 Renovated and slightly expanded in 2013, this Nassau County dog park has a sand base and small trees for shade. There are double gates at the entrances, canine water fountains and separate areas for big and small dogs (30 lbs and under). The dog park is handicapped accessible and the parking lot holds about 30 cars. The heavily used dog run in Christopher Morley Park is small (about a quarter of an acre), needs to be updated, and is not divided into large and small dog areas. A five-foot chain link fence borders the dog park and it has a double gate entry system. This Nassau County dog park has drinking water, benches, some shade, garbage cans, and wood chips for ground cover. There is ample parking. Dogs are not allowed in any other area of the park. The park is open year round from dawn to dusk. During summertime weekends (between Memorial Day and Labor Day), you must show proof of Nassau County residency or pay a non-resident parking fee. must be resident of E. Hills/Roslyn. Opened in October 2012, this Nassau County dog park, which is sponsored by Pet Supplies Plus, is the result of a campaign begun by LI-DOG in 2008. The dog park covers approximately one acre, is fenced and divided into large dog and small dog (25 lbs. and under) areas with separate double-gated entrances for each. The park also features benches, a shade structure, waste bag containers and water fountains—all provided by Pet Supplies Plus. The parking lot holds about 30 cars. To see what’s going on at the park, check out the Dog Park at Eisenhower Facebook Group. This intimate off-leash dog park was developed in Dennis Murray Park after the Garvies Point location was no longer available. The park is increasingly popular with Glen Cove residents and neighboring dog owners who appreciate the separated small and large dog (25 lbs. and over) areas. Park visitors have access to free waste bags, trash cans, and a seasonal canine water fountain. The park also features benches for visitors to sit, awnings for shade, trees, and a leash post within the double-gated entry. The parking lot is paved and periodically gets busy on warm weekday evenings. There is a separate gated playground close by, therefore visitors may need to be mindful of children. Goals for further development are in the works as are creative social events. Hours are from dawn to dusk and there currently is no fee for use. Donations are accepted and highly encouraged on the Glen Cove Dog Park webpage: . The Town of Oyster Bay opened this dog park in June 2012, and at this time it is the only dedicated dog park in the Town of Oyster Bay. LI-DOG worked closely with the Town to create this beautiful park. The park is approximately 1 acre and is divided into large dog and small dog (25 lbs. and under) areas. The ground is covered with wood chips and each side has natural shade trees, shade structures, water fountains, benches and tables, waste bag stations, garbage cans and double entry gates. The local dog park community donated a first-aid kit, which is mounted in the large dog park. An eight-foot, wrought-iron fence borders the perimeter of the park, and a six foot fence divides the small and large dog areas. The park is bordered by large trees on all sides. There is parking for about 25 cars, and additional parking on the bordering streets. Dog park rules are posted on both the large and small dog park. The hours of operation are from dawn to dusk. 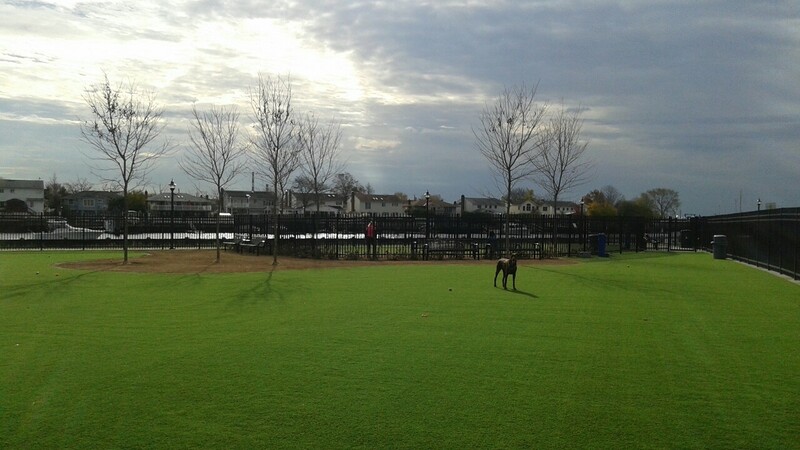 The beautiful Newbridge Road Dog Park celebrated its opening in September 2016 and is the first dog friendly area in a Town of Hempstead park. 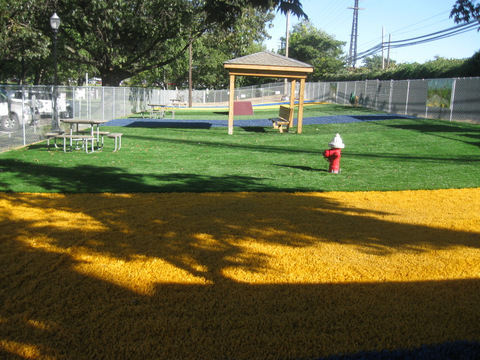 Its 14,025 square feet of play area (divided to give separate space for large and small dogs) is securely fenced and has paw-friendly synthetic turf for ground cover. Appropriately-sized agility equipment within each section, including ramps, hurdles, and hoops, ensures activity and fun for all. Picnic tables, with umbrellas, and benches provide ample seating area for all the human companions and water fountains are available for both people and pups. Hours are daily, 8AM to dusk.To check out what’s going on at the dog park, go to the Newbridge Road Dog Park Facebook Group. For more information including the rules for the dog park, visit the Town of Hempstead website. The dog run at Nickerson Beach is an off-leash area for dogs of all sizes; there are no separate large dog and small dog areas. It features double-gated entryways and a large open area of mostly sand and dirt with a few play structures. There are picnic tables, some covered by a canopy for shade, and there is a water source with hose and fountains. Ample parking is available within a short walking distance to the dog run entrance. This Nassau County dog park was opened on Oct 1st, 2009, and is the county’s 6th dog run. The park is at the Old Bethpage Restoration on Round Swamp Road in Old Bethpage. The new dog run has two areas – one for small dogs and one for large dogs. It also features “green” water systems – collecting and filtering rain water for the dogs to drink. The Boy Scouts donated benches for dog owners to sit on.Hours are the same as for Old Bethpage Village Restoration – Wed – Sunday 10 a.m. until 5 p.m. There is no fee for using the dog run. Located behind Village Hall, the Valley Stream Dog Run has lots of amenities. It is divided into large dog and small dog areas (dogs up to 30 lbs) and offers benches, agility equipment, poop bag dispensers, shade shelters, water fountains, first aid kits and a hand sanitizer station. The ground surface is various colors of artificial turf. The large dog park is about a half an acre. Parking is convenient, but there are no bathrooms nearby. Hours: 7AM to 9PM daily. Open to residents from the Village of Valley Stream for a yearly fee of $18; residents of the Central School District pay $55, and Town of Hempstead residents pay $110 per year. The large Nassau County dog park is about 1/4 of an acre and has benches and small trees for shade. There is also a small pool for doggie dips. The small dog area is also partially shaded and is popular with puppy owners and those with small breeds. Since it’s inception Tito’s Handmade Vodka has been committed to rescuing and protecting the animals that have appeared at the plant, often serendipitously, many of whom now thrive at the distillery and office.